Come Let Us Reason Together ~ Early Evening Thoughts …. One of the reasons I enjoy the TED talks and TEDEducation videos, is so often they manage to hit one something I’ve had a stray thought about and never thought about again. I also have decided that if my teachers had presented concepts this way, my grades would certainly have been better. I can only hope, that when I was teaching in India ~ some of my students felt I had reached out this way …. 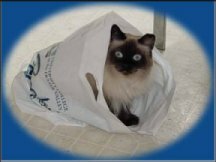 This video tackles invisibility … what, where, when and quite a bit of why … bear with the beginning – it will pay off shortly after the video starts. And For What Might Seem To Be Small Change ~ Early Evening Thoughts. Several months ago (has it really been that long? ), I wrote –>about Kiva.org.<– ~ a micro-lending organization that makes loans possible to people who would never otherwise qualify for loans. For as little as $25 ($27.50 actually if you add $2.50 to help defray operating expenses!) you can reach someone and help turn their lives around in a way that helps them operate as a business should. These people are not the recipients of a grant or gift (although there is nothing wrong with that) but rather they have to go through a loan process and then when enough people have loaned them money to reach their goal, the money is made available to them. The best part, is that they are expected to pay the loan back. When the loan is paid back, the original investment made is returned to the lender … who can take the money or reinvest it in someone else. One of the investments I made was with a woman by the name of –>Selima<–. Her business required expansion and she needed ten sheep and sixty chickens. I want to report (proudly I might add) that she has begun to repay the loan. She has 14 months to repay the investment a number of people made, but I have a feeling she will repay it much earlier than 14 months. I was reminded of a story about a very wealthy businessman during the depression. He passed by what we would call a beggar with a tin cup and a few pencils in the cup ~ if someone wanted to take them. The businessman reached in his pocket and threw two nickles in the cup and started to walk away…he stopped, turned around and went back. He said to the beggar, “I’m sorry, I treated you unfairly. It is obvious you are businessman, and that you have pencils for sale. I would like my pencils, please.” He held out his hand, and the rather startled beggar put two pencils in the mans hand. 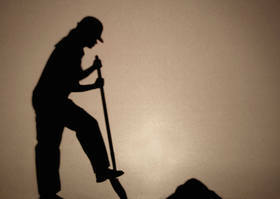 The point being, we can make changes in peoples lives and help them become businessmen and women. Several blogs have done articles about micro-lending overseas, and it’s something worth looking into and you can make a difference for what might seem to be small change. I hope you will seriously consider becoming a lender to the poor. Here’s the –>link to the website<– where you can learn much more! Why donate when you can empower? 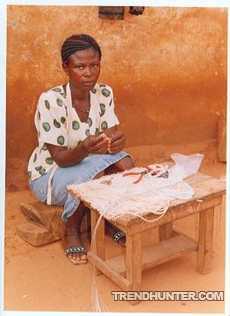 Kiva.org lets you loan money directly to an entrepreneur in the developing world. Specifically, the online site connects you to a network of entrepreneurs through local microfinance organizations. So far, Kiva has hooked up over $6 million in loans to more than 60,000 entrepreneurs. For example, Agnes Lawer (shown) is an entrepreneur in Ghana seeking a $900 loan to develop her bead manufacturing business. She plans to repay her loan in 9-12 months. You could loan her the $900 directly, or a portion. The Kiva site describes, “Kiva lets you connect with and loan money to unique small businesses in the developing world. By choosing a business on Kiva.org, you can “sponsor a business” and help the world’s working poor make great strides towards economic independence. Throughout the course of the loan (usually 6-12 months), you can receive email journal updates from the business you’ve sponsored. As loans are repaid, you get your loan money back. I also understand (although I’m still trying to confirm this) that Charles Gibson also did a piece on the news tonight on the subject. But – remember, you saw it here before they did!!!! I apologize for the quality of the screen shot – I’ll try to get a better one. Basically, she has had this business for 10 years. She breeds chickens, ducks and turkeys. 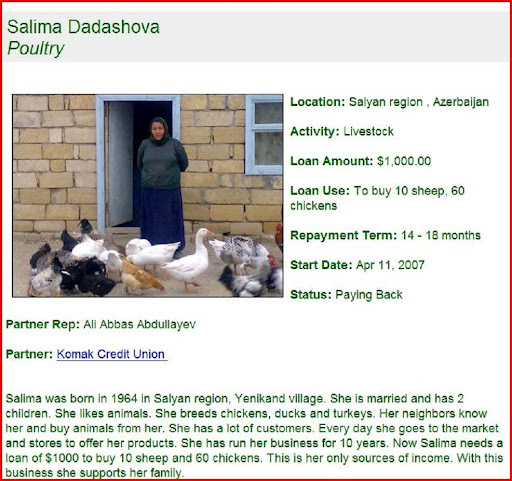 She needed to buy 10 sheep and 60 chickens. With a number of other investors she now has received the funds to expand her business. For more information visit http://www.kiva.org. I decided that I wanted to expand on this original post from earlier this evening. I just couldn’t get the idea out of my head. When I was growing up my parents were very giving to many people – some who had no idea where the “help” had come from. I enjoy helping in any way I can. When I had nothing a short time ago, it was amazing where help started coming from. I had read about the concept of micro-lending to ordinary people overseas. The statistics of pay-back for instance have been phenomenal. Most of the micro-loans are paid back. As in, the 95+ percent range. I then ran across this article which shows how anyone can make a difference for as little as $25 dollars at at time. Nicholas D. Kristof wrote this article for the New York Times and also put it on his blog. I must have read it a dozen times – getting more intrigued and excited each time. After I post the original recap, I went to the Kiva site and have now decided where I am going to “lend” some money. I’ll post more information on that Tuesday or Wednesday. As a “lender” there will be some expectation of being repaid. However, as a “lender” I have to realized that the business might fail … but that’s part of sharing in this unique way. There is another website that accepts donations, but I decided that I liked the Kiva approach – much more business-like. For those readers who ask me what they can do to help fight poverty, one option is to sit down at your computer and become a microfinancier. That’s what I did recently. From my laptop in New York, I lent $25 each to the owner of a TV repair shop in Afghanistan, a baker in Afghanistan, and a single mother running a clothing shop in the Dominican Republic. I did this through http://www.kiva.org, a Web site that provides information about entrepreneurs in poor countries — their photos, loan proposals and credit history — and allows people to make direct loans to them. 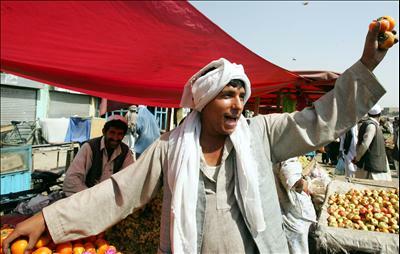 So on my arrival here in Afghanistan, I visited my new business partners to see how they were doing. On a muddy street in Kabul, Abdul Satar, a bushy-bearded man of 64, was sitting in the window of his bakery selling loaves for 12 cents each. He was astonished when I introduced myself as his banker, but he allowed me to analyze his business plan by sampling his bread: It was delicious. Mr. Abdul Satar had borrowed a total of $425 from a variety of lenders on Kiva.org, who besides me included Nathan in San Francisco, David in Rochester, N.Y., Sarah in Waltham, Mass., Nate in Fort Collins, Colo.; Cindy in Houston, and “Emily’s family” in Santa Barbara, Calif.
With the loan, Mr. Abdul Satar opened a second bakery nearby, with four employees, and he now benefits from economies of scale when he buys flour and firewood for his oven. “If you come back in 10 years, maybe I will have six more bakeries,” he said. Mr. Abdul Satar said he didn’t know what the Internet was, and he had certainly never been online. But Kiva works with a local lender affiliated with Mercy Corps, and that group finds borrowers and vets them. The local group, Ariana Financial Services, has only Afghan employees and is run by Storai Sadat, a dynamic young woman who was in her second year of medical school when the Taliban came to power and ended education for women. She ended up working for Mercy Corps and becoming a first-rate financier; some day she may take over Citigroup. Small loans to entrepreneurs are now widely recognized as an important tool against poverty. Muhammad Yunus won the Nobel Peace Prize last year for his pioneering work with microfinance in Bangladesh. In poor countries, commercial money lenders routinely charge interest rates of several hundred percent per year. Thus people tend to borrow for health emergencies rather than to finance a new business. And partly because poor people tend to have no access to banks, they also often can’t save money securely. Microfinance institutions typically focusing on lending to women, to give them more status and more opportunities. Ms. Sadat’s group does lend mostly to women, but it’s been difficult to connect some female borrowers with donors on Kiva — because many Afghans would be horrified at the thought of taking a woman’s photograph, let alone posting on the Internet. Web sites like Kiva are useful partly because they connect the donor directly to the beneficiary, without going through a bureaucratic and expensive layer of aid groups in between. Another terrific Web site in this area is http://www.globalgiving.com, which connects donors to would-be recipients. The main difference is that GlobalGiving is for donations, while Kiva is for loans. A young American couple, Matthew and Jessica Flannery, founded Kiva after they worked in Africa and realized that a major impediment to economic development was the unavailability of credit at any reasonable cost. I have decided that I am going to lend $25 dollars to three businesses. I won’t be as fortunate at Mr. Kristof and be able to travel to see each business, but just knowing I have had a part will be wonderful! Anyone else up for some grass roots banking? Always take a good look at what you’re about to eat. It’s not so important to know what it is, but it’s good to know what it was. 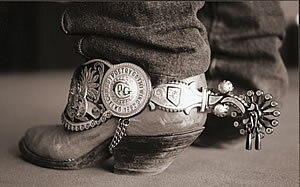 Never squat down when wearing your spurs.